*This post was originally published on February 10, 2017 to coincide with the exhibit of the Rachel Lambert Mellon Collection at the Virginia Museum of Fine Arts. 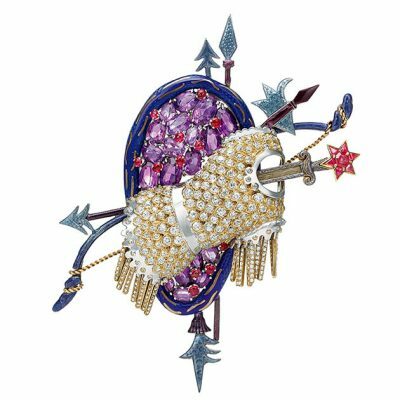 It is being highlighted again in celebration of the exhibit Jewels of the Imagination: Radiant Masterworks by Jean Schlumberger From The Mellon Collection at the Museum of Fine Arts in St. Petersburg, Florida from December 15, 2018 to March 31, 2019 and the . Schlumberger’s aesthetic was all about imagination. 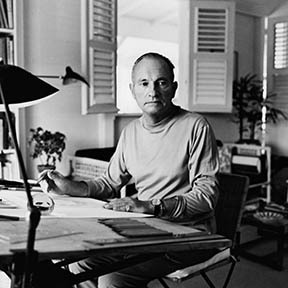 After he joined Tiffany as a signature designer in 1956, he became famous for his sea creatures, fantasy flowers and heraldic motifs set with an array of colorful gems accented by extraordinarily sculptural gold and platinum metalwork. A Renaissance spirit, some surrealist influences and a passion for nature inspired his jeweled flights of fancy. 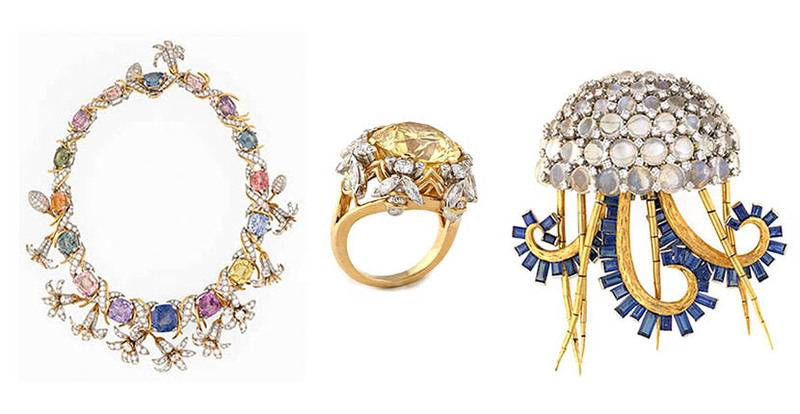 The most stylish women in the world collected Jean Schlumberger during the height of his career. Elizabeth Taylor, Lauren Bacall, Babe Paley and Millicent Rogers were all clients. 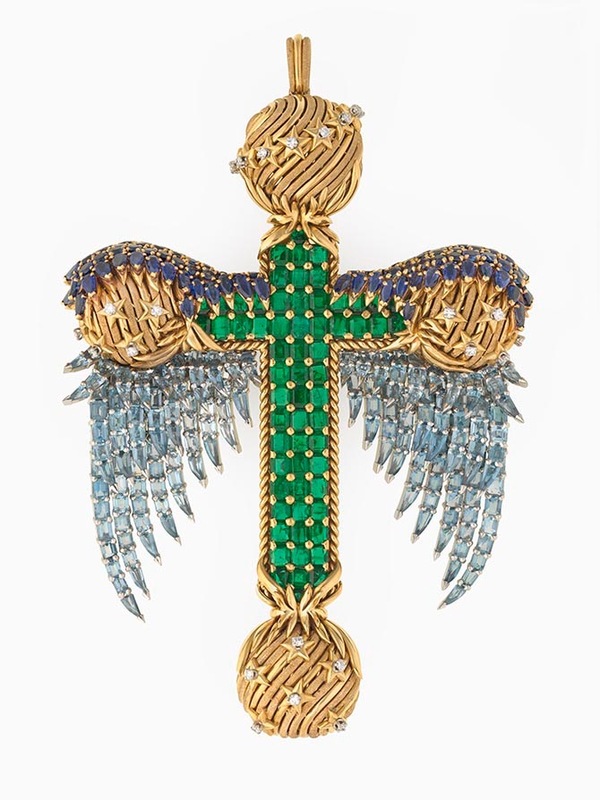 Fashion editor extraordinaire, Diana Vreeland reputedly kept her Trophée de Vaillance brooch by Schlumberger on her night table. The piece had a fringed breastplate, shield and spears conjuring up a medieval code of dress and honor. “It’s not at all subtle,” Vreeland once said of the design. “A Schlumberger lights up a whole room!” Jackie Kennedy wore her Schlumberger enamel bangles so frequently in the 1960s, the press dubbed the jewels, “Jackie Bangles.” The ruby two fruit clip by Schlumberger she received from John Kennedy to celebrate the birth of their son is part of the permanent collection at The Kennedy Library in Boston. Schlumberger’s most devoted client was the very private Bunny Mellon, otherwise known as Rachel Lambert Mellon. While it has long been common knowledge in jewelry circles, she had a substantial collection of Schlumberger’s work, exactly what or how many pieces she owned, has had the air of an urban jewelry myth. Unlike the other bold faced names who shopped with Schlumberger, Mrs. Mellon was rarely ever photographed at events wearing the major pieces. Her jewelry remained behind closed doors—until now. Mrs. Mellon believed Schlumberger’s work was art. 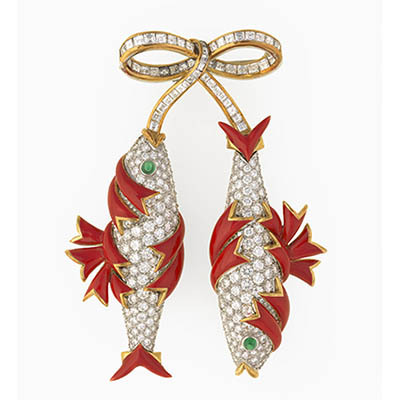 Only a couple of her Schlumberger items appeared in her estate sale at Sotheby’s in 2015. The rest—an astonishing 150 jewels and objects—were bequeathed by Mrs. Mellon to The Virginia Museum of Fine Arts in Richmond. The first exhibition of all the Schlumberger will be on display from February 10 to June 18, 2017. The installation is set up to study and enjoy the jewels. One brooch, for example, is in a case at the center of a table with chairs, pencils and pads for visitors to sit down and sketch the piece. It’s a wonderful detail Mrs. Mellon and Jean Schlumberger would have surely appreciated. 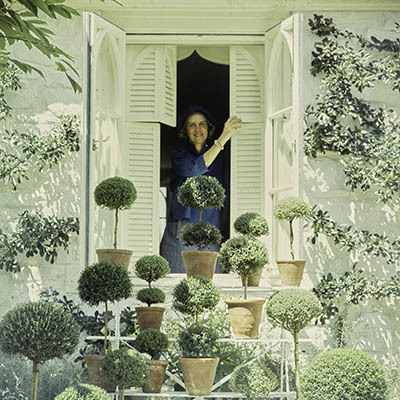 Bunny Mellon and Jean Schlumberger were soulmates of sorts. They both came from privileged backgrounds. They preferred to keep their personal lives very private. They shared a passion for nature. And both were self-taught in the areas of their creative interests. For Schlumberger it was, of course, jewelry. Horticulture was Mrs. Mellon’s area of expertise. Her supreme gardening talents were such that Jackie Kennedy asked her to redesign the Rose Garden at the White House in 1961. The layout of the space is still very much as she conceived it. According to Pierce MacGuire, whose acquaintance with Mrs. Mellon began when he took over the Schlumberger department at Tiffany in 1992 (five years after the designer passed away), “They were very close; she would sit with him and he would be drawing and things would happen.’’ Sometimes he created special commission pieces for Paul Mellon to give Bunny. Other times Schlumberger’s designs were inspired by an event in her life. She was most definitely his muse. Several designs in the collection directly reference the twosomes’ shared passion for nature. The collection includes two Butterfly bracelets made in 1956 that do not match exactly but are similar in style. 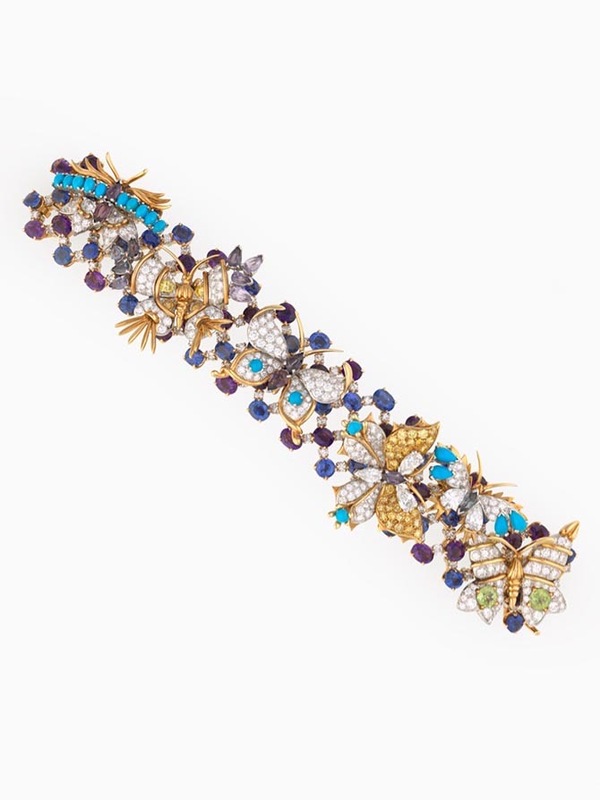 Each is set with amethyst, sapphires, turquoise, peridots and diamonds among other gems. The butterflies hover above the flowers and are set en tremblent to gently fly. Mrs. Mellon’s Bees ring (in the photo at top) features an 8.8-carat fancy colored diamond, she gave Schlumberger to set in the jewel. The insect references the garden as well as the bee motif in Napoleanic coat of arms. The original rendition of the ring had been designed with two bees in 1971 for Prince Napolean, the pretender to the Imperial Crown of France, to give his fiancée.